Located on the banks of the River Tiber, in a lively district rich in cultural and entertainment attractions, the Gran Meliá Rome is surrounded by the wonderful scenery of the historical Villa Agrippina and by the legends of ancient Rome. The Vatican and St. Peter’s Basilica are just a 5 minute walk from the hotel, from which guests can easily reach Castel S. Angelo, Pantheon, Campo dei Fiori and Piazza Navona. Masterpiece of the Grand Meliá Spanish brand, the Hotel is a luxury urban resort and is a true museum-hotel in the historic centre of Rome. Valuable archaeological remains were discovered during the buildings of the hotel, then attributed to the ruins of the ancient Villa Agrippina, that belonged to the mother of Emperor Nero. The Wellness is a space where guests can enjoy a relaxing Spa experience and purificate their body, mind and spirit. The 350 sqm area includes: sauna, steam bath with chromo/aromatherapy, sensorial showers, relaxation area, ice machine, vitality pool, swimming pool, hydromassage. Free access to the Wellness reserved for RedLevel guests. Open daily from 10 am to 8 pm. The gastronomy offer is wide; guests can choose among different restaurants offering both a Mediterranean and international cuisine. The Nectar Bar offers light lunches, snacks, desserts and cocktails. The guests of the Gran Meliá Rome can relax in the gardens and swimming pools, as well as in the wonderful roof 400 sqm garden with stunning 360° view over the Eternal City. The exclusive RedLevel service (available for some room typologies) includes: à la carte breakfast, exclusive access to Red Level Lounge with coffee, tea and water (from 12:00 to 19:00), open bar and aperitifs (from 19 to 21, premium brands not included), private check-in, personalized welcome gift, champagne in rooms, Clarins bathroom amenities, free access to the Wellness Centre, private reception area, exclusive pillow menu, aromatherapy in rooms, preferential booking for a la carte restaurant, Wellness treatments, leisure and entertainment activies, Nespresso coffee service in rooms, shoe cleaning (on request), free ironing service (2 items at arrival and 1 additional daily item), daily seasonal amenities in room. Tourist Tax – The municipality of Rome requires the payment of a tourist tax of € 7,00 per person/overnight, to be paid on spot. Spacious rooms in classic style with touches of the avant-garde, high quality fabrics, characterized by modern furniture with Italian-Spanish details. Private bathroom, shower in cascade with vertical massage, bathrobe and slippers. High-speed free wi-fi, Nespresso machine, view over S. Onofrio alley. Spacious and luminous rooms in classic style with touches of the avant-garde, high quality fabrics, characterized by modern furniture inspired to the Eternal city with luxury Spanish details. Private marble bathroom, shower in cascade with vertical massage, bathrobe and slippers. 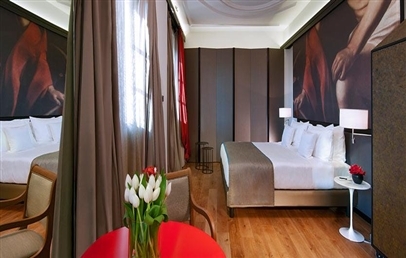 Spacious and luminous rooms in classic style with touches of the avant-garde and high quality fabrics. They feature handcrafted headboards with metal leaf and images of the famous Italian pictorial works, on exhibition in the city’s main museums. Private bathroom, shower in cascade with vertical massage, bathrobe and slippers. View over the city (e.g. Vatican dome, Castel Sant’Angelo). 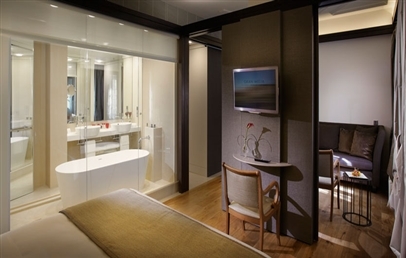 Spacious and luminous, the Grand Premium are superior rooms located in privileged areas of the hotel. Elegant interior décor, high quality fabrics, with touches of the avant-garde and luxury Spanish details. Wide marble bathroom in natural stone, some with a romantic round glass bathtub (subject to availability), bathrobe and slippers. View of the city. Spacious and modern rooms located in privileged areas of the Hotel. They have independent living room, elegant interior décor and are furnished in classic style with touches of the avant-garde, high quality fabrics and luxury Spanish details. Private glass bathroom integrated into the bedroom with luxurious finishing in marble and natural stone, round bathtub (subject to availability). View over the Orti Domiziani garden or Sant’ Onofrio alley. Elegant Suites with high ceilings, situated on the top floor of the Hotel and distributed in two spacious independent floors: the bedroom is on the first floor, a spacious living room is on the second floor. Loft-style architecture with refined modern lines, ideal for families, groups of friends or couples. Private glass bathroom integrated into the bedroom with luxurious finishing in marble and natural stone, round bathtub (subject to availability). View over the Vatican dome and the city.